Aric Anderson, Rora Blue, Danielle Emery, Anastasia Golosna, Sean Kauffman and David Nichols have all been accepted into the "Boundaries" show at Viewpoint Gallery for April 2019! Congratulations! Rudy Carson, Angelique Doty, Tara Duvall, Jose Gonzales, Stephanie Kadle, Malik Lee, Paul Lucky, Christina Messick, Annie Oakland, Claudia Pizano, Stephanie Sierra, Antonia Tapia, Megan Wagner and Craig Wheeler all have photo books on display at the Kaneko Gallery through May 4th. Congrats to Rora Blue for winning first place in the Perspectives Show in April 2018! Christina Messick, David Nichols, Angelique Doty, Kristina Hartman, Diana Simeroth, Brooklyn Billick, Hanna Peck, Sina ohammadi and Anastasia Golosna all have work accepted to the Crocker/Viewpoint show Perspectives in April 2018. Heather Merrifield has work exhibiting in the show Through the Lens in February, 2018. Larissa Kimmey has transferred for a 4 year degree in photography in 2017! Congratulations to Tysen Cannady has been hired as an art instructor in 2017. Timon Barkley had his photography published in a state-wide ad campaign by the Department of Health. Joe Padilla hired as a CRC photographer at The Connection in Fall 2016. Congratulations to K. Benning for being awarded 1st place in the Phi Beta Kappa Art show. Congratulations to C. Serou for being awarded 2nd place in the Phi Beta Kappa Art show. Congrats to P. Devol for being selected as a Finalist in the 36th Annual College Photography Contest of 2016 from Photographer's Forum. D. Gary was hired as an event photographer for the Phi Beta Kappa celebration. F. Tull will be having a solo show, called Fairytales Gone Rogue, opening Sept 27th from 6-10pm at the Sweetspot at 1675 Hilltop Drive, Redding Ca. Good job to J. Padilla, who has been hired as a sports photographer for ARC this fall. Cheers to T. Devriend for being awarded the Francis Burt photo grant, to T. Cannady for being awarded the Fine Arts Club grant, and to M. Vang for being awarded the Thatcher-Routt Photo grant! L. Kimmey is a finalist in the Photographer's Forum Best of College Contest for 2014, congrats! 18 students for the Studio Lighting course have had their video demonstrations shown as part of a national conference on technology in November of 2013. Great work! R. Turner, V. Kozycz, B. Anderson, B. Bailey, S. Madrid, M. Yushkov, C. Smith, K. Hoven, R. D-angelo, S. Walters, M. Minno, C. Schwartz, T. Cannady, and J. Schopher have a show "Scavenge: A documentary photo series" at the Artists Collaborative Gallery from April 13-May 6th, with an opening reception during Second Saturday, April 13th from 5-8 pm. Please come join us! Hailey Parkhouse, Mike Ibe and Jennifer Enright were all selected as finalists in the 33rd Annual College Photography Contest sponsored by Nikon. Their images will be published in a book the end of March, 2013! Jenn Schopher was the photographer for the Sizzling Sirens performance troupe at Harlow's Night Club, and a spread of her images were shown in the newspaper this March, 2013. Larissa Kimmey has a piece accepted in the "12" art competition at Viewpoint Gallery. David Dance has photography displayed in an artshow at the Sacramento Fine Arts Center in November 2012. Tyson Cannady, Bruce Riley, Jessica Pratt, Skye Wedlock and Victoria Kozycz all have artwork on display at the Crocker Museum. Bryce Fraser has started professional work as a concert photographer. This October he was featured in a interview at the Examiner.com for his work. Paula Turner has started a freelance business as a photographer and has had hwer images used for commercial adds, as seen in News and Review. Maura Reilly sold her photograph at the Records of Light gallery show in midtown. Stefanie Hammarsten had her image published as part of an article for the Vacaville Reporter 1/25/2012. Mai Vang is a finalist for Photographer's Forum Student Contest and will be published in the 2012 book! Ryan Lowis has a freelance photography business as a commercial and wedding photographer. Kristina Martin and Brandi Lira both sold photographs at the Shades of Light Exhibit. Sandy Follett has had a variety of exhibitions and has won awards at Placer Arts Photography exhibitions, Sacramento County Fair Photography (Best in Show), El Dorado Hills Art Association (1st Place), among others. Many of our students, including Andrea Lum, David Dance, Sandy Follett, Kim Rochford and Kyle Chiodo are part of the Governor's Collection exhibited at the State Capitol. Kyle Chiodo has shown and sold multiple photographic artworks at J Street Gallery. Andrea Lum was a finalist for the 31st Annual Student Photo Contest by Nikon in 2011. The entire Documentary Photography class published a book in 2011. 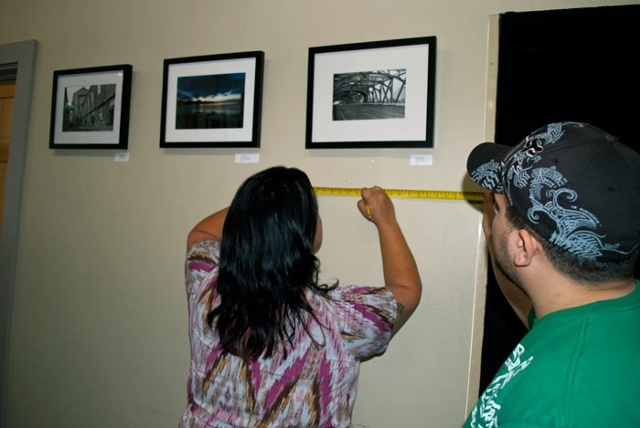 The entire Documentary Photography class exhibited at Shades of Light, at Maestro Gallery, and The Third Eye at Photosource Gallery.